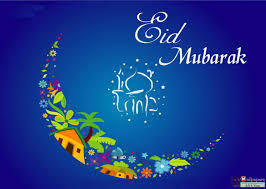 Muslims are celebrating Eid al-Adha today, one of the two most important festival in the Muslim Calendar. Eid al-Adha, or "Festival of Sacrifice", is celebrated by Muslims to mark the occasion when Allah (God) appeared to Ibrahim in a dream and asked him to sacrifice his son, Ishmael, to demonstrate his devotion to the Almighty. Ignoring the advice of the Devil, who tried to tempt Ibrahim into disobeying God by saying he should spare Ishmael, Ibrahim was about to press ahead with the sacrifice when Allah stopped him and gave him a lamb to kill instead. The story is designed to demonstrate how Ibrahim's devotion passed even the sternest test, and is told in similar fashion in the Jewish Torah and Christian Old Testament, where God asks Abraham to sacrifice his son Isaac. Today the story is commemorated on Eid by the sacrifice of a sheep, or sometimes a goat, although in Britain the animal must be killed at a slaughterhouse. The day is a public holiday in Muslim countries, and the festival's Arabic title has connotations of a period of rejoicing that comes back time and again. Eid al-Adha is not to be confused with the other major festival, Eid al-Fitr, or festival of breaking of the fast, which marks the end of the holy month of Ramadan. This article is republished from The Telegraph. In a saucepan add water and sugar, stir until sugar dissolves and bring to a boil, turn down heat to medium high, simmer until the syrup thickens. You will feel the the syrup thicken as you stir the mixture around, it’ll take around 15 minutes to get to desired thickness. Test by putting a small drop of the syrup on a plate, the syrup should be thick and it should glide very slowly on the plate. While the syrup is on the stove, mix the rest of the ingredients in a bowl. Once syrup is ready, remove from stove, pour into the bowl with the other ingredients. Stir until creamy and mixed well. Pour into the pan, sprinkle the pistachio on top. Let it cool in room temperature. Cut in 2 inch squares.